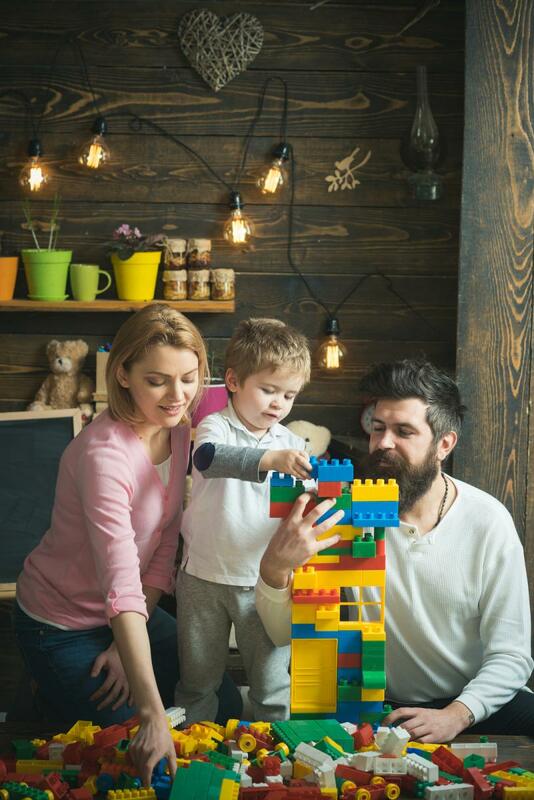 • In 2017, more than 1,200 families were connected to support services to improve their parenting skills. • In 2017, Monadnock United Way launched a pilot collective impact initiative that brought together four home visiting programs. The alliance received a $51,000 grant in 2018 from the NH Charitable Foundation to increase the number of families receiving home visiting services by 20 percent. • More than 200 babies and young children received developmental, social and emotional screenings in 2017. • More than 330 families received scholarships in 2017 to help them access child care. Cheshire County has the third-highest child maltreatment rate in the state. 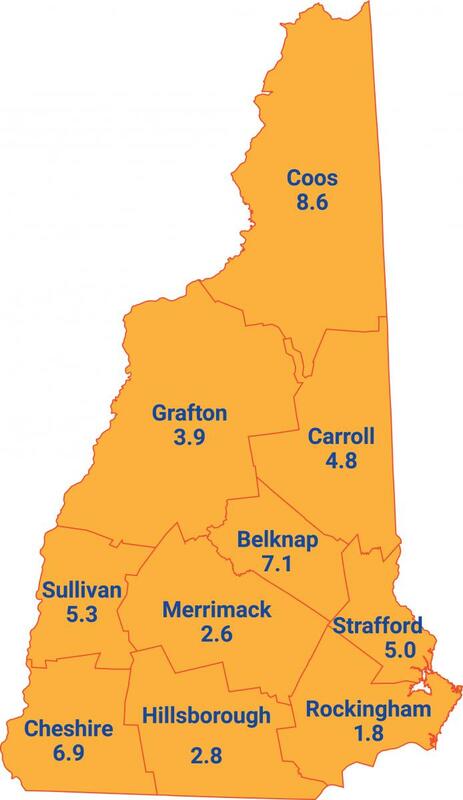 The statewide New Hampshire child maltreatment rate per 1,000 is 3.5. The map breaks down the child maltreatement rate per 1,000 for each county. Sources: NH Department Health and Human Services and the 2016 U.S. Census Population Estimates. High school graduates have higher earning potential, contribute more to their local economies, are more engaged in their communities and are more likely to raise kids who also graduate on time. • In 2017, 152 youth facing adversity were matched with a mentor. • Volunteers gave more than 2,500 hours of their time in 2017 to help build literacy skills in children. • In 2017, the First Day Project provided more than 600 backpacks full of school supplies to two elementary schools to support the needs of students. • 5 out of 7 schools in our region scored lower than the state average in the percentage of 11th grade students scoring proficient or above on the SAT math assessment. • 5 out of 7 schools in our region scored lower than the state average in the percentage of 11th grade students scoring proficient or above on the SAT reading assessment. • Across the state, 44 percent of 11th grade students scored proficient or above on the SAT math assessment, and 66 percent of 11th grade students scored proficient or above on the SAT reading assessment. Note: The NH Department of Education administers the SAT math and reading assessments to all 11th grade students. Our wages are among the lowest in the state. They have not kept pace with the rising costs of housing, healthcare and education. • 193 low-income families were provided with free legal representation to preserve or obtain basic life necessities, including shelter, income, employment and safety. • In 2017, nearly 90 uninsured or underinsured families received scholarships to help them access mental health services. • The number of people who used the MyFreeTaxes program, which was widely promoted by MUW, increased by 37 percent from 2017 to 2018. This means more low-income individuals and families were able to access tax-return dollars they may not have otherwise accessed. 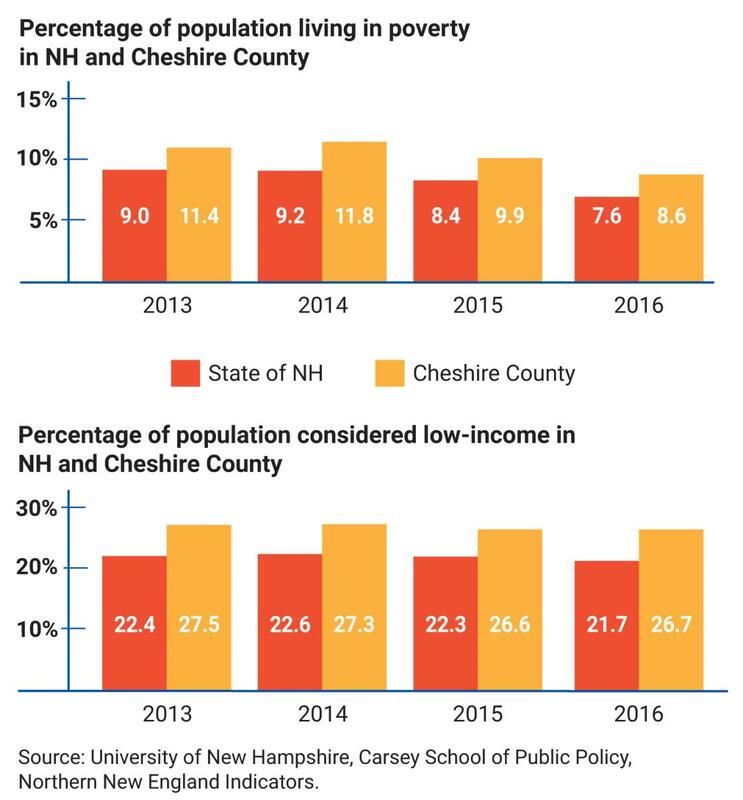 In Cheshire County, the percentage of the population living in poverty, and the percentage of the population considered low-income, has been higher than the state average for the last four years for which data is available. Our focus on financial stability includes making sure all community members have their foundational basic needs met. Below are some of the things Monadnock United Way and its partners helped the community. Food: Provided meals to more than 3,300 Monadnock region residents in need. Shelter: 2,200* people received shelter and support services to reduce homelessness. Heat: Nearly 4,000 income-eligible families were enrolled for fuel assistance benefits. Transportation: More than 18,200 critical rides were provided to seniors and people with disabilities. 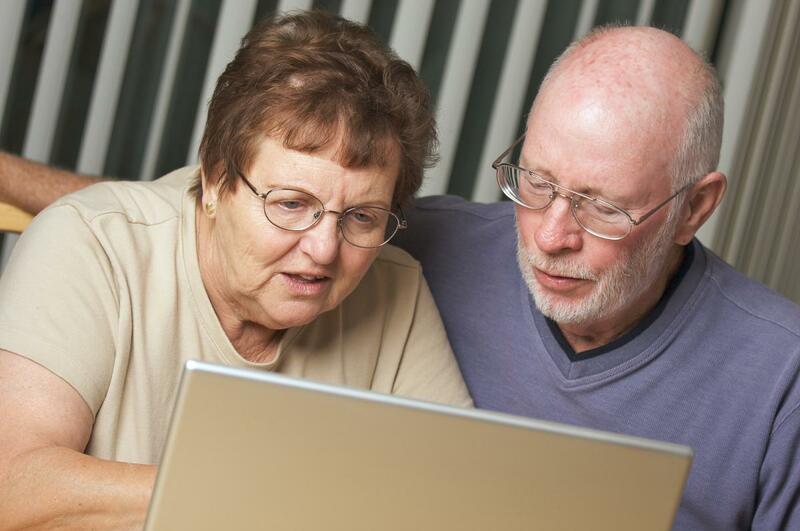 * Note: We cannot be sure that shelter clients aren't duplicated. Our focus on financial stability and basic needs helped David Thorhaug and his family go from experiencing homelessness after disaster struck their family to having stable housing and giving back to their new community. Read the story here. Impact Monadnock (IM) merged with MUW in 2017. It is now our signature early childhood initiative, focused on preparing children from birth to age 5 for future academic, career and life success. IM’s vision is that all children in the Monadnock region and their families are healthy, learning and thriving, now and in the future. • Backing Impact Monadnock Business Ambassadors in efforts to expand child- and family-friendly policies and practices in workplaces. • Increasing use of developmental screening tool in medical and educational settings. 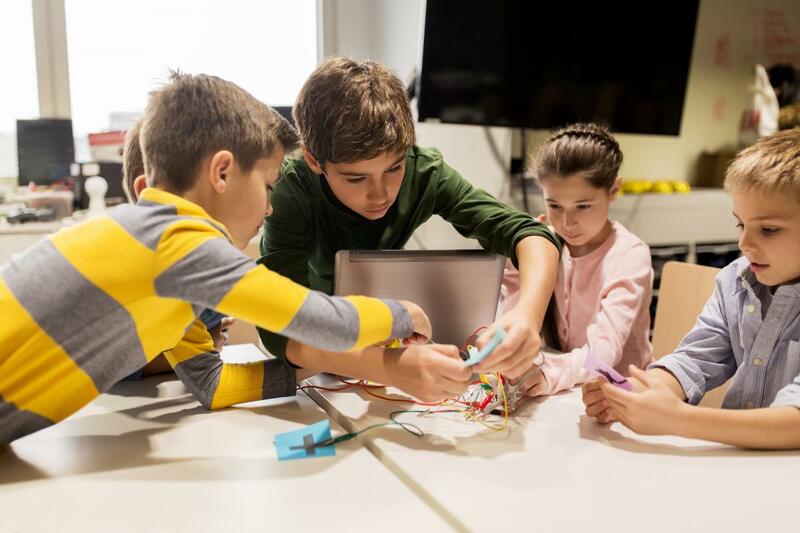 • Creating learning community who will work on implementing the Pyramid Model, a framework that provides tools for early childhood professionals supporting social and emotional development of all young children. • Forming the Monadnock Home Visiting Alliance, a collective impact initiative consisting of four agencies working together to expand the reach of effective home visiting services. Visit www.impactmonadnock.org for more information. Read about the Monadnock Home Visiting Alliance, a pilot collective impact initiative launched by MUW in 2017, has impacted families in the region.